Mission Statement To do what we can to ensure that as students from Big Park Community and West Sedona schools pass from the 3rd to higher grades they are prepared to transition from "learning to read" to "reading to learn". Services and Projects We provide one-on-one help (in a group setting) to 2nd and 3rd graders who are behind their classmates in reading, writing and/or arithmetic. Come to our (no obligation) Orientation on Sept 15th from 9 to noon (Room 803 at West Sedona School) to find out more about what we do and how we do it. We especially need volunteers for the program at West Sedona School (see our website for more information about dates and times). The Sedona Literacy Center is still hoping to find a few more volunteers for its after school tutoring program, especially at West Sedona School. More information about the history of this long standing grass-roots program can be found on its website (www.sedonaliteracy.org). Tutoring takes place from the week of September 28th and the end of March 2016 this year. Call Carolyn Fisher, Director, at 928-284-4638 for more information. The number of students who can participate in this program depends on the number of volunteers since it's one-on-one work. 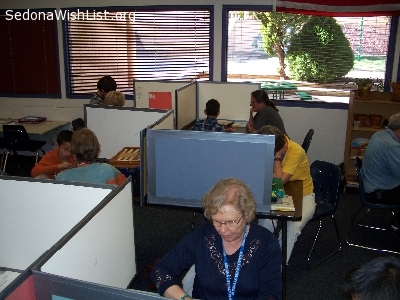 We are experiencing a shortage of volunteers, especially for the West Sedona School program which meets on Tuesday and Thursday afternoons from 2 to about 4 pm. Come to our Orientation on Sept 9th, 2015, at Big Park Community School (25 Saddlehorn Rd, in the Village of Oak Creek), from 1 to 3 pm to learn more.